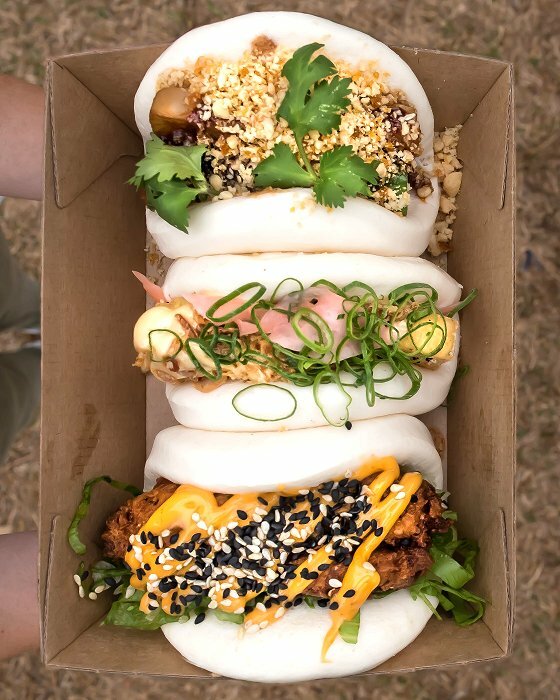 Bao Brothers Eatery, located in the Garden of Unearthly Delights, is serving up Bao buns with a twist. The urban style food truck from Newcastle, is all about Asian style street food, combined with contemporary flavours to produce their own unique Taiwanese steamed Bao bun. The staff are friendly and give off a cool and rustic vibe; emphasised by their menu named after famous Hip-Hop artists. Chef, David Griffin, runs the business with his brother-in-law, and after wanting a change from working in fine-dining restaurants, they both travelled to South East Asia and fell in love with the food and culture. 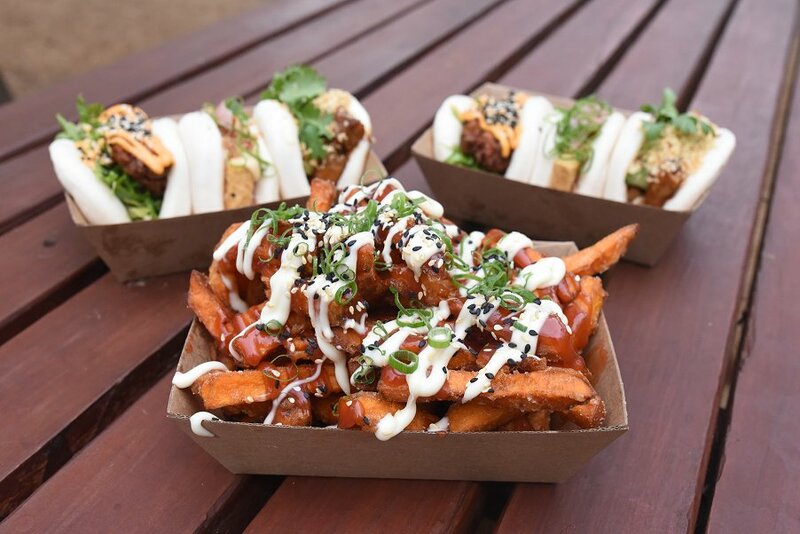 Coming back to Australia, they decided to create their own business with flavours inspired by their travels, thus creating the Bao Brothers Eatery Food Truck. Expanding interstate, the Bao Brothers Eatery have now come to South Australia for the Adelaide Fringe festival, wowing locals with their Asian street food inspired dishes. On our visit, we were greeted with friendly service and smiling faces who served us their Bao 3Sum meal deal. First we tried their Notorious P.I.G Bao. Containing braised pork, pickled cucumber, hoisin, peanut praline and coriander, this dish was packed with Asian inspired flavours. The pork was cooked beautifully and I could not get enough. The peanut topping gave it an earthy flavour, which paired nicely with the sweetness of the bun, while the tang of the Hoisin sauce was the perfect pairing with the pork and the additional mayonnaise. The overall flavours worked really well together and as soon as I had finished the Bao I wanted to go back and get another. The next Bao we tried was the T.W.A Tofu With Attitude. Consisting of miso tofu with soy mayo, pickled ginger, crispy shallots and spring onions, this Bao was well made. I am usually not a major lover of tofu but this Bao exceeded expectations. The tofu was soft and sightly sweet with a good crumb coating, which was not too thick. The mayonnaise added pleasing flavours to the bun and the pickled ginger added a sour tang but was well balanced with the shallots and it didn’t overpower the whole flavours of the dish. Very delicious overall and prefect for both vegetarians and meat lovers, or those who want to give tofu a go. The last Bao on the tasting plate was the Tupac Chikur. Containing Southern fried chicken with chilli mayo, cos lettuce and toasted sesame, this dish again had a lovely balance of flavours. A little more spicier than the previous Bao’s, the chicken was crumbed nicely and was very tender and fresh. The spicy flavours came from the chicken coating and the sauce but the fresh and cool lettuce was a lovely balance to cool the palate and give nice even flavours. The Loaded Sweet Potato Fries were topped with plum ketchup, kewpie mayonnaise, sesame seeds and spring onions. The fries were lovely and crispy and looked like the Asian equivalent of chips and gravy. The sauce was sweet with a slight tang in the plum ketchup. The chips were also seasoned well, with a good coating, but not too salty. Overall I could not get enough of these chips and the accompanying sauces and wished I had the plum ketchup at home. Each Bao, and even the fries were beautifully presented, as we wanted to take photos of the food rather than eat it. The Bao’s were decent in size and by the end of eating the three I was very satisfied buy not just the amount, but by the perfect balance of the massive flavour combinations. The Bao Brothers Eatery also have a small Urban Eatery located in Newcastle NSW, so if you love Bao and are on holiday there, this would be a great place to stop by. But for the time being, the Bao Brothers Eatery Food Truck will be located in the Garden of Unearthly Delights until the Fringe closes. This food truck was definitely a hit and I for one will be definitely be going back before the fringe ends. So make sure to try out Bao Brother’s soon before they head home to New South Wales, you don’t want to miss out.